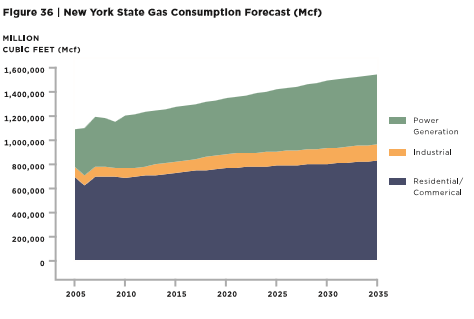 The graph above shows New York’s forecast for natural gas use for the next 20 years, increasing year over year. In fact, according to the energy plan, the demand for natural gas in electricity generation is expected to grow from 7.5 trillion cubic feet (Tcf), a 24 percent share in 2011, to nine Tcf (27 percent share) in 2035. But saying natural gas doesn’t reduce greenhouse gases (GHG) is objectively false and completely disregards the facts. New York City, which is transitioning to natural gas as a heating source in many of its buildings, now has the cleanest air it has seen in 50 years. Recent EPA data even show a notable decrease in methane emissions from natural gas systems between 2011 and 2012. It’s clear that New York is betting heavily on natural gas as an energy source for the near future, and why wouldn’t they? The Marcellus Shale has vast proven reserves, and Pennsylvanians are happy to provide New Yorkers with affordable, clean, and abundant energy that creates high paying jobs and allows money to flow into their local municipalities. Hopefully, someday, New York’s Southern Tier will be able to experience these benefits and provide the energy its state is relying on for the future.